Welcome to the second installment of “Hills of the Eastside”. After doing Education Hill in the last installment, it made sense to move onto Hollywood hill, because it is directly to the north and they are really the same ridge. I chose 124th / 128th as the logical dividing point between the two hills because it’s a bit of a valley and it’s a busy street. The north boundary is Woodinville Duvall road, which is also a bit arbitrary. The west and east boundaries are the Sammamish river valley and Avondale Road, which, as the low points, are much less arbitrary. I’ll break the hill into two sections; the north and the south. You can connect them a couple of ways if you would like. The easiest way to the top from the South is A (172nd), a steady climb that doesn’t get very steep. The reason it doesn’t get very steep is that you’re already near the top of Education hill when you start, but you will still climb nearly 200’ to the top. At the end there is a bike/ped trail that can get you over to 168th (the top of climb C). It has a good shoulder most of the way and doesn’t have too much traffic. That’s really the only easy way up to the top. Starting at 124th on the west, B (162nd PL NE to the north) takes you most of the way up. The road surface is good and traffic is calm, but it’s pretty steep – say, 13% or so – on the early pitches. At the top, the road is closed off with a barrier *but* on a bike you can go around it and continue on 168th to the top of C. There is another climb on that section that I should show but don’t; it isn’t that long but it’s pretty steep. From the west, we have C (Hollywood Hill). If you say “Hollywood Hill”, this is the climb that most people think of, so I guess it’s the traditional way up. It’s a fairly nice constant climb, and would be one that I seek out except for the fact that a) it doesn’t have a shoulder and 2) it’s the main way up the hill from “civilization”, so it gets a lot of traffic. If you’re doing to ride it, a rear blinker is highly recommended. Pavement and traffic may be an issue on descents. You can turn left at the first bend (155th) for another option. There are two nice ways to climb up from the East (Avondale) side of the hill. 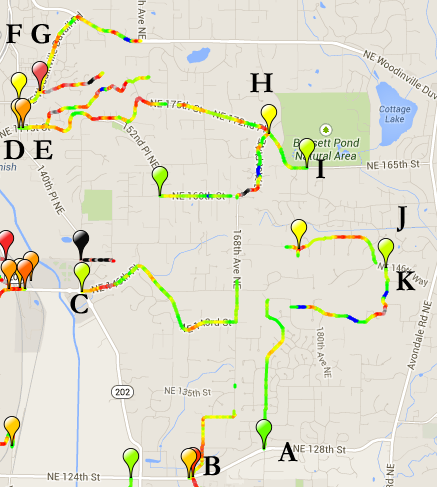 J (NE 154th) is a nice climb up the east side from Avondale. Just before the top, there is a small dirt trail that takes you through to the west side of the hill. K (NE 143rd PL) is another nice climb up the east side from Avondale. It tops out near the top of A, and you can take the same trail through to the west side. Starting in Woodinville, there are 3 ways to get up to the top. D (NE 171st) and E (NE 174th) start at the same point. The first is hard, and the second one is harder. Both of these take you up to the high point on Hollywood. Nearby, you can find G (NE 178th), a steep climb up to a dead end. F (Woodinville-Duvall Road) is the traditional route up, and also the easiest, used by rides such as RSVP to get east enough to head north towards Maltby. From the east side, there are a couple of ways up. I (NE 172nd Pl) is a nice rolling climb up from Avondale that isn’t too steep, and it will take you all the way to the top. It’s a great road to ride the other way; curvy and fast with a nice long flat spot at the bottom. On the way up, you can turn left (south), and H (171st Pl) will take you upfrom 172nd to the top of the traditional climb. It’s very steep at the top. Climbs D and I meet at a stop sign at 164th and 175th. You can turn north and get up to Woodinville-Duvall, or you can head south and work your way back to the south and down the West side of the hill.